Whisky Birmingham 2014 – the city's biggest and best annual whisky extravaganza is on its way. March marks the month of merriness, joy, and seriously pondering over the wonder that is life, ideally with a glass of the good stuff in your hand: whisky. 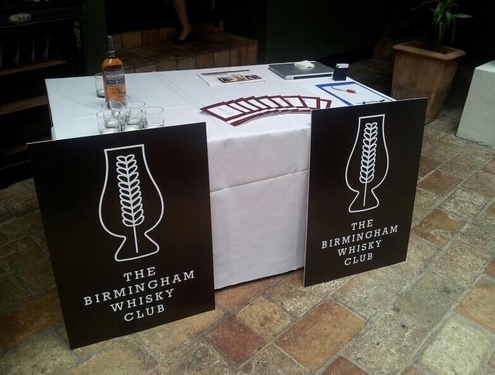 Whisky Birmingham (at the Bond, Digbeth) has become something to mark on your calendar, the event is not only a fun exploration as well as education about the tipple you're holding, but somewhere to meet like minded folk, and, dare I say it, network. It's not just whisky on show however; Birmingham-based cheesemongers Curds & Whey and Kneals Chocolates also join the festival line-up for the first time for special whisky-themed tasting sessions. Chocolate, cheese, whisky, it sounds almost-perfect. For the more, old-school festival-goer, global cigar importers Hunters & Frankau return for a Cuban cigar and whisky masterclass. Local bloggers Living Room Whisky will be reprising their popular 'bloggers' choice' stand, with Soul Food Project and Pop-Up Dosa laying on the grub. If you're sceptical, don't be, I've enjoyed Kneals Chocolates, Pop-Up Dosa, as well as Soul Food Project's food countless times, and with a glass of whisky in your hand, it is even better. See you at 12.00.